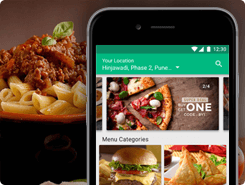 Seamlessly connect foodies with restaurants nearby with a branded food ordering app like GrubHub with custom features and integrations as per your requirements. We Make It Accessible And Affordable For Anyone Around The World To Start Their Own Online Food Delivery Business. We provide delivery startups and aggregators a custom on-demand food delivery app development solution. 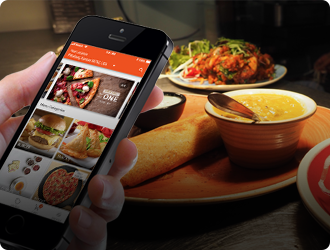 Create a seamless food ordering app experience for your customers and get more ROI from your food outlets. Create a direct line of communication between you and customers with your own restaurant mobile app. 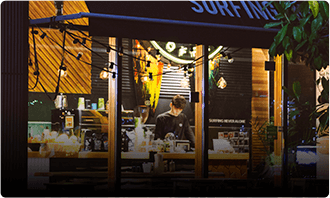 Launch a white label food ordering app for your target customer base that enables them to seamlessly order food in a few simple taps from their favorite restaurants nearby. Quickly get started with with email and social login options. A rich browsing experience with beautifully laid out restaurant listings and more. Find the right dish, cuisine or restaurant with intelligent filters and sorting options. Customers get real-time notifications to know more about their order status. Seamless and secure order payments with multiple choices to choose from. Option to pick up a food order from a nearby restaurant when convenient. Give feedback on the food ordering and delivery experience. Explore new deals and use promo codes for discounts at checkout. Easily manage basic info, addresses, payment details, favorites, etc. Customers can call customer support or refer FAQ section for help. Make it easy for restaurant owners/managers to receive, approve and dispatch orders right from an easy to use mobile app. A central hub to keep a tab on all incoming and outgoing orders. Update business name, contact details, business hours, photos and more from the app. Partners can add/ update their menu listings, prices, items, minimum order amount, etc. Add account details, view successful and pending payment settlements in one place. Restaurants get a direct line of communication with their customers to build trust. Create and add new deals and offers to reward customers and gain new ones. Partners get useful insights on their business performance and can grow faster. Restaurant partners get useful information about their online customer base. Report any type to issue to the platform owner to keep things running smoothly. 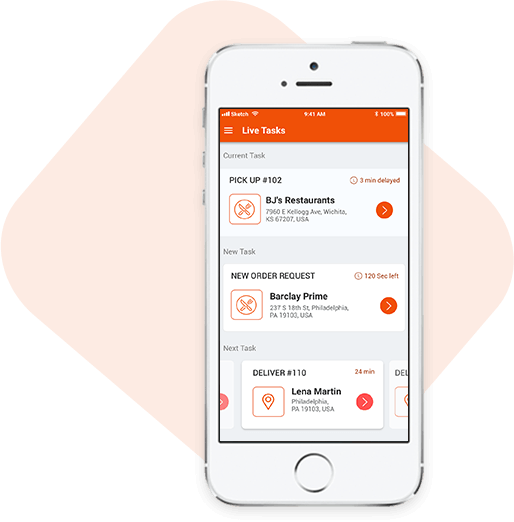 The perfect companion app for any delivery agent that makes order dispatch and timely fulfillment much more efficient. 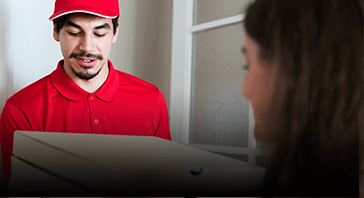 Orders are assigned to nearby delivery agents right on the dedicated mobile app provided to them. All important information for a successful order fulfillment is made available in one place. Delivery agents can manage his availability with a simple online/offline toggle. 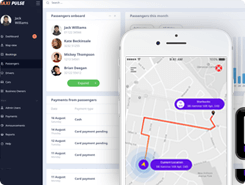 Delivery agents can track their payments, job history and key metrics. Easy management of profile related settings. A powerful web dashboard to manage all aspects of your food delivery business operations from a central hub with actionable analytics for continuous optimization. The platform owner gets a powerful browser-based panel to manage everything. 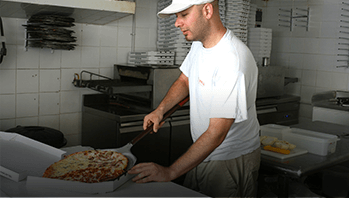 Add and manage all restaurants on the platform and maintain a robust supply side. Get menu listings from restaurant partners and make them available for ordering. Admin can view details of all the app users, view their order details and more. Keep a tab on all the orders being processed through the platform with key metrics. Set restaurant commission rates with per partner and global options and make payments. View customer feedback for restaurants, flag poor performers and maintain standards. Create new deals, offers, and discounts and approve deals from restaurant partners. Manage email, SMS, and app notification settings for customers and partners. Get useful stats and insights to take data-driven decisions and grow the platform. 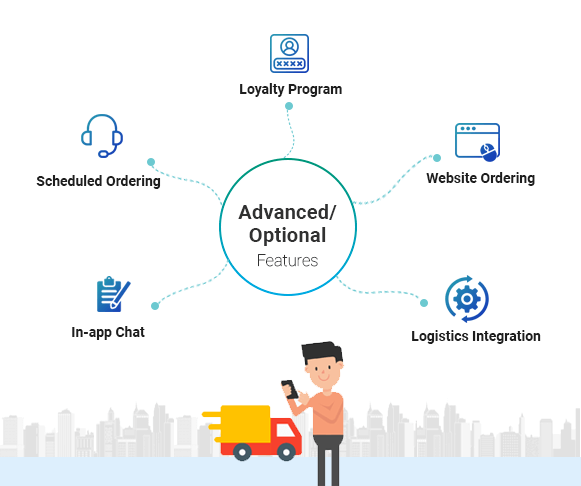 Extend the functionality of your food delivery platform with new features, enhancements, and third-party platform integrations. Give your customers a solid option to order from a fully responsive web app. 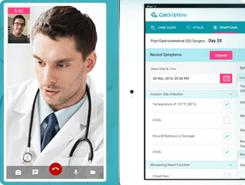 Allow customers to connect with customer support with in-app messaging. Integrate with third-party logistics partners to make food delivery efficient. Introduce a loyalty program for your food ordering app users for higher revenues. Give a convenient option to get food delivered at a later time and place. Interested In Launching Your On-Demand Food Delivery App? We are in the very early stages of a broad, secular shift to online/mobile food ordering. This creates tremendous opportunity for entrepreneurs and restaurant businesses to build their own online food ordering services for new and existing markets. We have created a mobile-first food ordering development platform with some major advantages for your business. Our solution is fully branded and customizable with provision for new features, enhancements, and integrations. 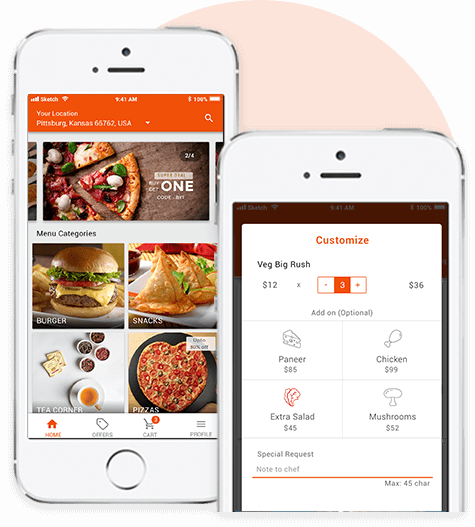 We already have a base food ordering app solution resulting in faster time to market and lower development costs. We have gained some key insights developing on-demand apps which enable us to offer robust solutions. 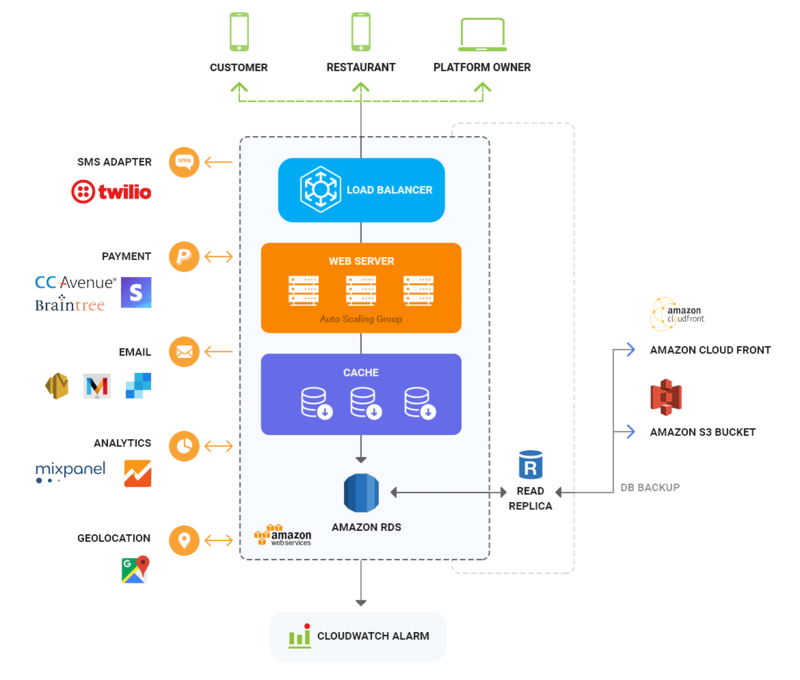 The solution is built on a robust cloud infrastructure and rigorously tested to handle high volume food orders. Use your own delivery network or integrate with a popular logistics service provider in your area. Launch your Grubhub like app in multiple regions with multi-currency and language support. We add the payment gateways of our choice with built-in support for the most popular ones. 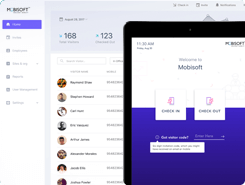 Everything from the food ordering app to the admin panel has been designed for intuitive use. We ensure that you get the maximum ROI with a dedicated team from launch to support and maintenance. 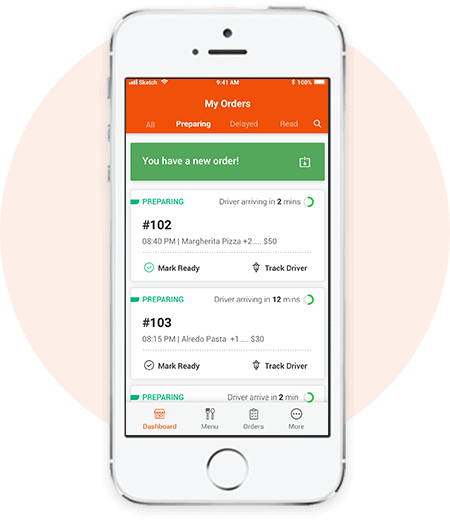 Built on a robust and high performance technology stack with powerful third-party integrations and customizations to power your food delivery app platform. A white label food ordering app like UberEats to instantly connect food lovers with nearby restaurants. 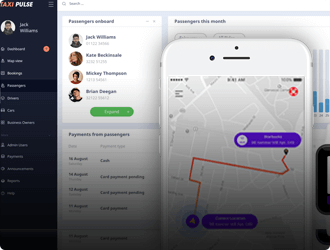 Launch a Uber like taxi app in your region with our whitelabel taxi app development solution. 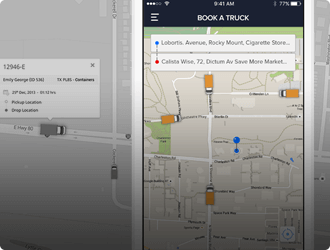 A custom Uber Freight like app development solution for trucking and logistics businesses. 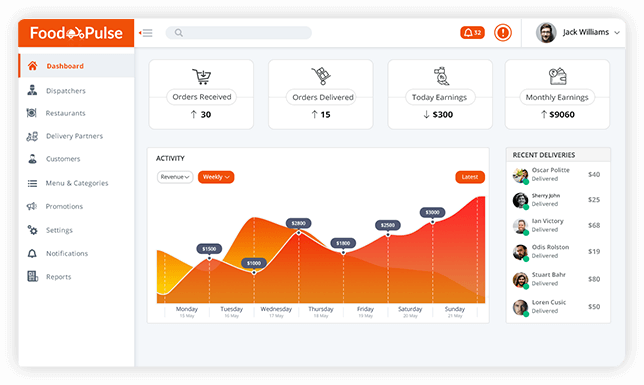 We already have a pre-built solution that includes native iOS & Android apps for both customers and restaurant owners and a web-based admin panel for the platform owner to manage everything in one place. Based on your branding requirements, feature requests, custom integrations and add-ons, the time may vary. Please feel free to contact our dedicated sales team to know more. Food ordering apps primarily make money through commissions they charge restaurant partners on a per order basis. Another popular strategy is to charge restaurant partners for sponsored ads and paid listings which offer to provide greater visibility in search results and on app screens. As your app becomes popular, running ads from trusted ad networks like Google Adwords and Facebook Ads can also bring in additional revenue. We can develop a custom branded mobile app for your restaurant chain with powerful features for your customers and a web panel to manage your restaurant business operations. A restaurant app can help your business with brand building, taking online orders directly, accepting table reservations and many other benefits.